Strength: He's very strong and has plenty of stamina, but he's isn't very fast. He's trained himself to be faster than most large wolves, but he's still not very fast. He's also very honest and smart. Weakness: He can be blunt and anger people easily. He's not very fast and he is half blind. Markings: A brown scratch mark over his left eye, and unusually long canine incisors. Personality: Dusk's the silent type. He will stay back and say nothing, but will nod and grunt if he needs to. He is a loyal friend who sticks with you to the end, but doesn't really look the part. He looks a bit menacing and cold at first, but he's a sucker for pups and other cute things. He likes those who are dense and simple minded. However, he can be very blunt. Dusk can be kind and smile if the time comes, and he's happy to give advice to those who need it. Dusk's like a big brother to everyone. Though, he doesn't bother to show it on his face or use his mouth. He rarely gets angry and is very patient. 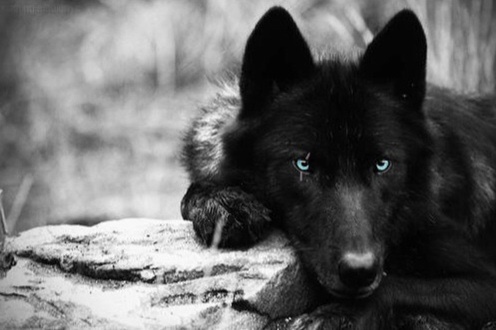 Other: Dusk was born on a full moon at midnight on Halloween in the River Creek pack, and he was judged and disliked by the more superstitious wolves. He was raised in a pack and gained his big brother side from it. Later he had his adult ceremony, but on the same day the pack shamen died from a winter disease. Now almost everyone was suspicious of him. His mother still was hesitating to do that, but his father had disowned his odd ball son. After the ceremony, his siblings started disappearing and dying from unusual occurances. His mother finally was actually afraid of her last son, but his sister still stuck to his side. Her name was Lilac. He loved her with all his heart, and she was the only reason he still in the pack stayed. But one day, his father snapped from all the criticizing wolves who judged him from his offspring,so he decided to kill Dusk in his sleep. Lilac found out,and stopped him before he could, but she died in the process. By now,Dusk was a year and a half old. He handicapped his father by tearing out his eye,but he received a scar across his right eye in the battle. He finally ran while his father was yelling out in pain. He later met Phoenix and Blue while he lived as a loner. 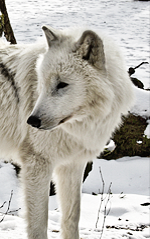 They banded together and started a small nomadic pack with the name the Sirius Wolves.